Request and estimate/bid: Please call or email us, and we will be glad to come by and measure your cabinets and provide you with an estimate for fabrication and installation of granite counter tops. Our installed price for granite countertops varies based on the color, edge option, and size of the project. Color Selections: Granite is available in various colors. Templating: We will set up an appointment to template your job after you have made a color selection and have accepted our bid. The deposit will be required at the time of the template. Sinks, Cook Tops, and Faucets: All will be required to be on site and available at the time of the template. Seams: Granite slabs are produced in 8 foot lengths. However, slabs in some colors are available up to 10 feet long. Seams will be placed in long runs and are based on the size of the slabs, location of sinks, cook tops, or other appliances or variables. We go to great lengths to minimize the number of seams. The placement of the seam will be discussed at the time of the template. Edges: We offer various types of edges. Payment: Upon acceptance of our bid, and before a stone can be ordered, a deposit of the total cost of the specially ordered stone and 1/3 of the labor cost will be required. 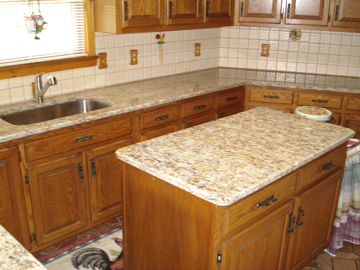 Sealing: All of our granite countertops are sealed at installation. It is recommended to seal your countertops annually.